Their fifth film together marks a definite high point (no pun intended) in the partnership of Martin Scorsese and Leonardo DiCaprio. Wildly inventive, rude and outrageous, it is one of Scorsese’s best. It is also one of his funniest films. 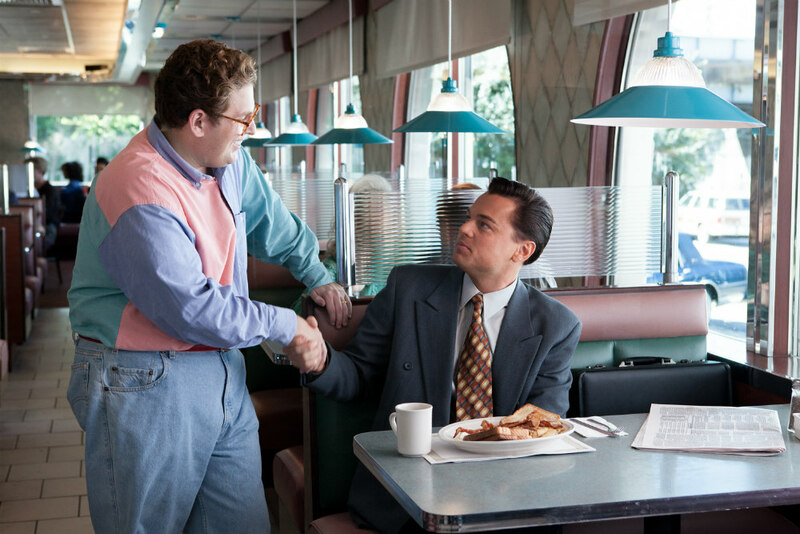 Scorsese’s work has often had a darkly comic streak with films like The King of Comedy (1982), After Hours (1985) and even Goodfellas (1990) (“I amuse you?”), but The Wolf of Wall Street is one of his few films that is downright hilarious, mostly due to the ridiculous characters that inhabit this rich world and the stuff they get up to. Alongside this bigger stroke of dark comedy though Scorsese’s other trademark touches can be seen throughout. His usual flashy style and direction all match the excess on display here – colourful visuals and bold, inventive camera moves that serve to emphasise the ‘high life’ of Jordan’s world. And Scorsese’s regular editor Thelma Schoonmaker is also back (her 19th collaboration with Scorsese!) with her playful and quick editing style which again draws you into this manic, drug-fuelled world and Jordan’s own crazy state of mind. Matching Scorsese’s bold style is an unflinching and razor-sharp script by Terence Winter (Boardwalk Empire). 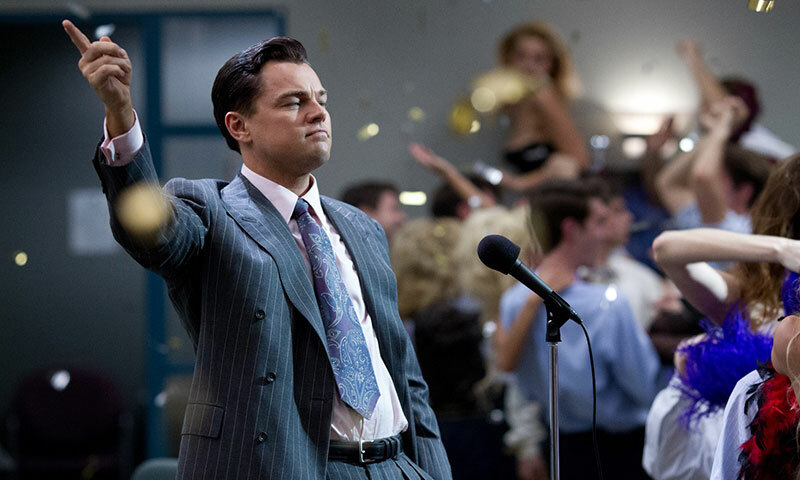 Winter’s script was adapted from Jordan Belfort’s own autobiography, also called The Wolf of Wall Street. Appropriately then Belfort (in the form of Leo) is the narrator who guides us through the journey of his rise to infamy, even directly addressing the viewer at some points. One of the joys of the film is how outrageous most of the tales are that Jordan tells us – tales which we will never know are real or fake, or maybe just highly exaggerated. Winter plays with this ambiguity throughout his funny, smart script. In particular he creates an interesting ending that will leave many debating over its moral message for days after they’ve watched it. Although it is a long stretch at 3 hours, you barely feel it, Winter always keeping the pace up. Even for the parts that might seem a little slow (Jordan’s many inspirational speeches to his company for example) there is always another outrageous story or unbelievable twist in the tale just around the corner in Winter’s outstanding adaptation. Playing our unreliable narrator is Leonardo DiCaprio in one of his best ever roles, even ahead of the deliciously villainous Calvin Candie in Django Unchained (2012) last year. Leo also plays with the idea of Jordan’s ambiguity in the story, creating him as a smooth-talking charmer for the most part, but who at the same time is also wild, manipulative and possibly more than a little insane. Again showing the strength of their partnership, Scorsese isn’t afraid to let Leo go over-the-top in certain scenes, letting him take the reins and show just how power mad this man was, and indeed to prove why he is so often named one of the greatest actors of this generation. Although Leo is the standout of this film there are others who more than match his ability throughout. Jonah Hill also gives a career-best turn as Donnie Azoff, Jordan’s business partner and a character also based on a real person. He starts off a little caricature-ish with his bleach white teeth and huge glasses, but soon Hill settles into the role and makes it work, turning Donnie into a funny and outlandish man who might even be more disturbed than Jordan. Yet Hill also proves himself to be a more than capable actor in the more serious moments of the plot, especially for scenes showing Donnie and Jordan’s close friendship. Another performance worth a mention is Margot Robbie in one of her first big screen roles as Jordan’s long-suffering wife Naomi. What begins as the usual mistress/harlot role turns into something more deep and complicated as Naomi gets dragged into Jordan’s world of corruption and excess, Robbie lending necessary heart and emotion to the role later on in the story. In addition to these The Wolf of Wall Street is jam-packed full of great performances from many others, so many that it would take too long to name and review them all. However a few of the best are: Jon Bernthal, Kyle Chandler, Jean Dujardin, Shea Whigham (in more of a cameo than anything, but any time Shea Whigham is in a film or a TV show, however briefly, that’s ok with me), Matthew McConaughey and Joanna Lumley. A lot of these are only short roles but they all still make a lasting impact here, even alongside DiCaprio himself. Martin Scorsese has made plenty of films about the rise and fall of many different great men. 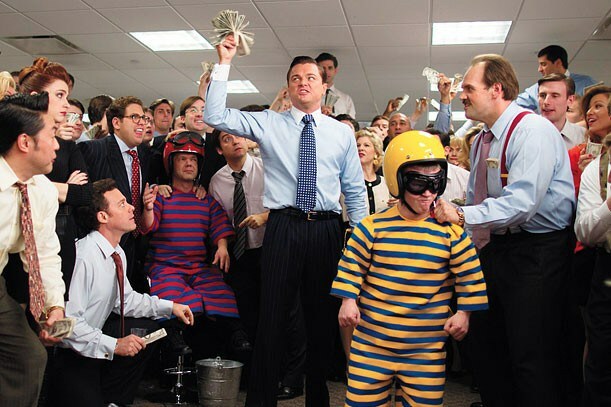 However with The Wolf of Wall Street we get an entirely new sort of Scorsese film on the subject – a playful, wild and debauched tale that at once revels in the excess of the rich world of Jordan Belfort, and also serves as a warning against his corrupt, damaging lifestyle. With an outstanding, daring and satirical script by Terence Winter, it also boasts Leonardo DiCaprio in one of his greatest roles to date. And for all these reasons Scorsese’s Wolf is most certainly one of the best, if not THE best film to be released in 2014. Long may the Martin Scorsese and Leonardo DiCaprio partnership last. ~ by square-eyed-geek on February 19, 2014. Totally agree… It’s such an enjoyable film in spite of it being about such an unsavoury character but Scorsese and DiCaprio make it work. This entry was posted on February 19, 2014 at 8:58 am and is filed under Film, Reviews.You can follow any responses to this entry through the RSS 2.0 feed.You can leave a response, or trackback from your own site.